In recent years, more people have been deciding to stay in their homes after retirement and age in place as they reach their golden years. While senior citizens can live more independent lives in their own homes than they can in a retirement home or assisted living community, the physical and mental setbacks that people experience as they age can make this difficult. Senior citizens aging in place may need assistance with daily activities including housekeeping, meal preparation, and running errands as well as personal assistance for activities like bathing and getting dressed. For senior citizens that choose to age in place but understand they need assistance, home health care services are a great option. When it comes to providing home health care for elderly adults, families often choose one of three solutions. They either have a family member act as an informal caregiver, hire a caregiver themselves, or work with a home health agency to find a caregiver. At Assisting Hands, we provide home health care and elderly services to help senior citizens and adults with disabilities. We employ professional caregivers who are bonded, insured, and highly trained, and we put them through an intense screening process to make sure we hire caregivers who will treat our clients with compassion and respect. Personal Assistance: We can help seniors and people with disabilities with daily activities that include restroom use, bathing, dressing, incontinence, and other personal hygiene activities. Meal Preparation: We can prepare nutritious meals daily and help those who need assistance eating. Errands and Transportation: We can run various errands including trips to the grocery store and provide transportation to get our clients to appointments, family gatherings, and religious services. Light Housekeeping: We will handle light housekeeping tasks such as dusting, cleaning, vacuuming, dishes, and laundry to help keep the home clean and organized. Companionship: Our caregivers are more than just care providers, they can be excellent companions for your loved one. We will engage in conversation and fun activities to build a personal relationship with our clients. Live-In Care: If your loved one needs care around the clock, we can provide live-in care services. Live-in caregivers live at the home so they can provide assistance 24/7, but they do sleep during the night shift. 24 Hour Care: Our 24-hour care services are ideal for seniors who require 24 hours of attentive care. We will have 2-3 caregivers in your home so that there is always a caregiver awake and on shift. Care Management: Our caregivers will provide medication reminders and ensure that your loved one follows their doctor’s orders concerning diet and exercise. Licensed, bonded, and insured caregivers who are employed by the agency and can file for worker’s compensation through their employer. Independent caregivers are uninsured which leaves you responsible if a caregiver is hurt on the job. If your regular caregiver calls in sick, another caregiver will be provided by the home care agency. You must find your own replacement if an independent caregiver calls in sick. Caregivers from a home care agency are trained and disciplined by their employer. You are responsible for training or confirming the experience of independent caregivers, and you are also responsible for discipline up to and including termination. 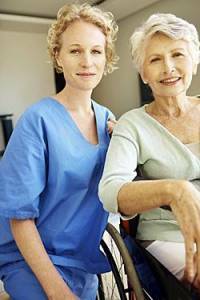 It is your responsibility to evaluate the skills of an independent caregiver. A home care agency will send you a caregiver who meets their high expectations. You are responsible for ensuring that your independent caregivers have legal status to work in the U.S., and for filing taxes regarding the payment of your caregiver. If you have an elderly family member that is choosing to age in place, but needs daily assistance, talk to the professionals at Assisting Hands about our home care services in Chicago and its suburbs. Our caregivers are extensively trained and carefully screened so you can rest assured that your loved one will not only have excellent care, but good company as well.